It’s a boom time in the UK for music festivals but with everybody eager to set up camp it can be very difficult to get hold of tickets. So, for those braving the festival crush, here are some tips and information. Get in their first – Be ready on the booking site at least ten minutes before the tickets go on sale. Do you have enough money to pay - It might sound like a silly question but so many people have been caught out by some last minute financial mismanagement. 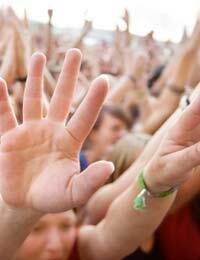 Bookmark as many websites that are selling the festival tickets as you can. - This will enable you to quickly move between sites if any prove fruitless. Get friends to buy more than one ticket - Arrange with your festival friends that if anyone gets through they will order all the tickets. This will lower the chances of the group being split up, with one member being left at home. Don’t rely on the internet – Many people forget that the internet is not only the way to book. Prepare a list of ticket site phone numbers to call whilst keeping an eye on the screen. Remember to register – If you are planning to go to Glastonbury then don’t forget to register on their booking site well in advance of the ticket sale. Trying to get hold of that elusive ticket can be a very trying business, but don’t lose heart and give up until the last one is snapped up. The booking websites have a habit of giving way under the enormous demand but they will keep reviving, so keep refreshing the page and persist. However desperate you may be, it is strongly advised not succumb to the allure of the eBay ticket tout. There are countless morally unsound individuals waiting on eBay to ensnare the panic buyers into paying ridiculously over the odds for a ticket. Instead, browse the forums or websites of music festivals like Leeds and Reading, as they often offer alternative places to find tickets. If you are still without ticket then why not consider ditching the big festival crowds altogether and opting for something cheaper, smaller but bursting with character. With Glastonbury is serious danger of being swamped by its own popularity and unfortunate luck with the weather, another option is to avoid the big music festivals altogether. One of the benefits of the ‘festival boom’ is that alternative choices have mushroomed - literally hundreds of festivals of all shapes and sizes are popping across the British landscape. Weary of the hype, crushing popularity and high prices, more and more people are turning their noses up at the big commercial festivals, and instead opting for a new breed of smaller events. Instead of trying to appeal to everyone, many of these festivals have their unique little charms, not just in showcasing certain types of music – like folk, dance or jazz – but in their ethos – some are environmental sound, some only sell food and drink from the local area and there’s even one that caters exclusively for 14-18 year olds. Camping at a festival is akin to going on holiday anyway, so why not go the whole hog and head overseas for your festival experience? Increasing numbers are realising that festivals like Spain’s Sonar, Denmark’s Roskilde and Holland’s Lowlands offer great line-ups, better value, better chance of sunshine plus the novelty of being on a foreign holiday.